Eros comfortably sleeps up to 9 guests in its 4 smartly furnished guest cabins. Each air-conditioned room is handsomely appointed with original teak paneling, tasteful artwork, ample storage to unpack your belongings, and all the bedside conveniences of home. Hatches provide natural light as well as the option for fresh air ventilation. Daily housekeeping is included. The Master Queen Stateroom features a deluxe memory foam queen bed with premium luxury bedding, and all the bedside amenities of home. A private ensuite bathroom features a Jacuzzi tub, shower, and electric head. Perfect for a couple, the Double Stateroom features a deluxe memory foam double bed. Private ensuite bathroom features a head, sink and shower. The Triple Cabin features a bunk bed with lower double bed and upper twin. Ideal for two to three children, or a couple with child. Beds are laterally staggered to provide greater overhead spaciousness. An adjacent bathroom is shared with the Double Cabin across the hall. The Double Cabin features two twin beds in staggered bunk configuration to allow greater overhead spaciousness. The Double Cabin shares a bathroom with the Triple Cabin across the hallway. 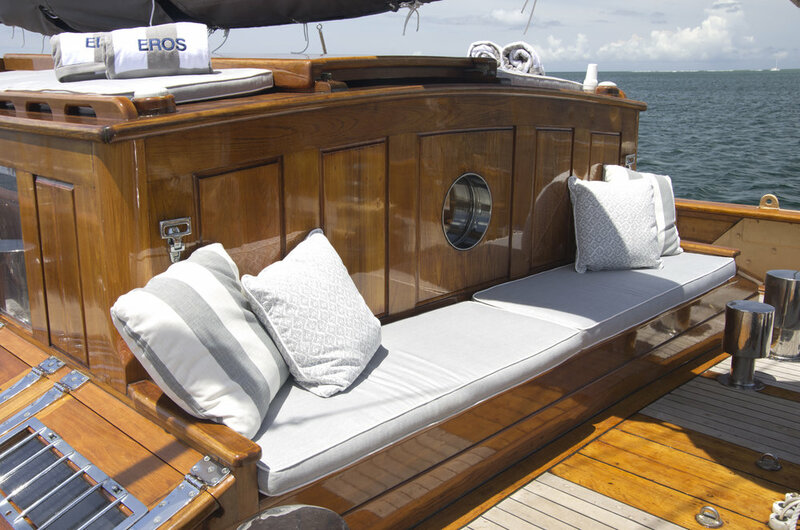 On board Eros, you’ll find many places to take in your magical surroundings, from generous gathering spaces for group entertaining to intimate, cozy areas where you may retire for privacy. Coastal chic décor is crisp and refined, bathed in subtle maritime hues that complement the expansive scenery. Great memories are made around the dining table, and there are few as special as this. Situated just ahead of the steering position, Eros’ outdoor dining table is perfectly located to provide unimpeded views during casual meals, sunset cocktails and elegant dinners alike. Comfortable under sail, cool under the awning, and majestic under the stars, this expandable teak table with wraparound upholstered seating and overstuffed pillows seats up to eight. A favorite indoor space for most of our guests, the deckhouse features ample seating beneath large picture windows, with music controls at your fingertips. Dual chart tables double as an indoor desk area. Take a break from the outdoors without missing a beat of scenery. It’s the ideal place to catch up on some reading, check your emails, enjoy intimate conversation, or steal an afternoon nap. Some guests have even been known to sleep in the deckhouse. The original teak paneled dining saloon hearkens back to the nights when colorful personages from Greek tycoons to the King and Queen of Spain dined at this very table. With a nod towards the original Art Deco décor, we have retained the dining saloon’s early grandeur, updating it with luxurious fabrics & tableware. Comfortably seats 8 guests. Opposite the dining saloon, the living saloon features card table with banquette, Yamaha electric piano, game cabinet and flat screen television with Direct TV. We have over 1000 movies on board, or plug in your device to access your own library. We envision heated card games, board games, and perhaps a lively song night in this intimate and social space. 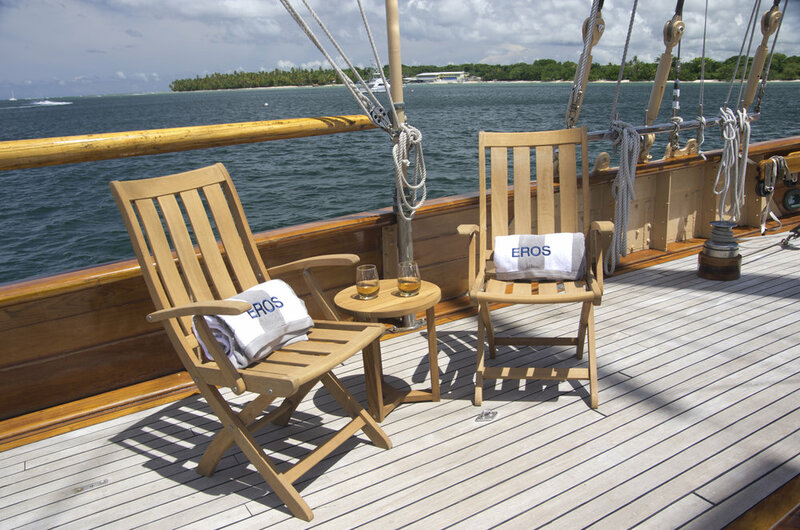 Eros offers numerous seating and lounging areas on deck, all perfectly suited for sunbathing, reading, napping or socializing as you take in 360 degrees of breathtaking scenery. Whether you seek sun or shade, privacy or the company of friends and family, there is a place for you on board. An assortment of comfortable teak furniture can be arranged in various settings around the yacht for lounging, socializing and dining.